The Third Man is a 1949 British film noir, directed by Carol Reed and written by Graham Greene. It stars Joseph Cotten, Alida Valli, Orson Welles, and Trevor Howard. Set in post-war Vienna, the film focuses on Holly Martins, an American who is given a job by his friend Harry Lime, but when he arrives the man is dead. He then meets with Lime's acquaintances in an attempt to investigate his suspicious death. The atmospheric use of black-and-white expressionist cinematography by Robert Krasker, with harsh lighting and distorted "Dutch angle" camera angles, is a key feature of The Third Man. Combined with the unique theme music, seedy locations and acclaimed performances from the cast, the style evokes the atmosphere of an exhausted, cynical, post-war Vienna at the start of the Cold War. Greene published the novella of the same name which he originally wrote as preparation for the screenplay. Anton Karas wrote and performed the score, which used only the zither; its title music "The Third Man Theme" topped the international music charts in 1950, bringing the previously unknown performer international fame. It is considered one of the greatest films of all time, celebrated for its acting, musical score and atmospheric cinematography. Opportunistic racketeering thrives in a damaged and impoverished Allied-occupied Vienna, which is divided into four sectors each controlled by one of the occupying forces: American, British, French, and Soviet. These powers share the duties of law enforcement in the city. American pulp Western writer Holly Martins (Joseph Cotten) comes to the city seeking his childhood friend, Harry Lime (Orson Welles), who has offered him a job. Upon arrival he discovers that Lime was killed just hours earlier by a speeding truck while crossing the street. Martins attends Lime's funeral, where he meets two British Army Police: Sergeant Paine (Bernard Lee), a fan of Martins' pulp novels; and his superior, Major Calloway (Trevor Howard), who says Lime was a criminal and suggests Martins leave town. An official of the British occupying forces (Wilfrid Hyde-White) subsequently approaches Martins, requesting that he give a lecture and offering to pay for his lodging. Viewing this as an opportunity to clear his friend's name, Martins decides to remain in Vienna. He receives an invitation to meet from Lime's friend, "Baron" Kurtz (Ernst Deutsch), who tells Martins that he, along with another friend, Popescu (Siegfried Breuer), carried Lime to the side of the street after the accident. Before dying, according to Kurtz, Lime asked Kurtz and Popescu to take care of Martins and Anna Schmidt (Alida Valli), Lime's actress girlfriend. Hoping to gather more information, Martins goes to see Anna at her theatre, where she suggests in passing that Harry's death may not have been accidental. She then accompanies Martins to question the porter at Lime's apartment building. The porter claims Lime was killed immediately and could not have given any instructions to his friends before dying. He also states that Kurtz and Popescu did not move the body out of the street alone, but were helped by a third man. Martins berates him for not being more forthcoming with the police about what he knows. Concerned for his family's safety, the porter indignantly tells Martins not to involve him. Shortly afterwards the police, searching Anna's flat for evidence, find and confiscate her forged passport and detain her. Anna tells Martins that she is of Czechoslovak nationality and will be deported from Austria by the Russian occupying forces if discovered. Martins visits Lime's "medical adviser", Dr. Winkel (Erich Ponto), who says that he arrived at the accident after Lime was dead, and only two men were present. Later, the porter secretly offers Martins more information but is murdered before their arranged meeting. When Martins arrives, unaware of the murder, a young boy recognizes him as having argued with the porter earlier and points this out to the gathering bystanders, who become hostile, and then mob-like. Escaping from them, Martins returns to the hotel, and a cab whisks him away. He fears it is taking him to his death, but it delivers him to the book club. With no lecture prepared, he stumbles until Popescu, in the audience, asks him about his next book. Martins replies that it will be called The Third Man, "a murder story" inspired by facts. Popescu tells Martins that he should stick to fiction. Martins sees two thugs approaching and flees. Martins visits Anna to say good-bye and finds that she also knows of Lime's misdeeds, but that her feelings toward him are unchanged. She tells him she is to be deported. Upon leaving her flat, he notices someone watching from a dark doorway; a neighbour's lit window briefly reveals the person to be Lime, who flees, ignoring Martins's calls. Martins summons Calloway, who deduces that Lime has escaped through the sewers. The British police immediately exhume Lime's coffin and discover that the body is that of Joseph Harbin, an orderly who stole penicillin for Lime and went missing after turning informant. The next day, Martins goes to Kurtz and demands to see Lime. Lime comes out to meet him and they ride Vienna's Ferris wheel, the Wiener Riesenrad. Lime obliquely threatens Martins's life but relents when told that the police already know his death and funeral were faked. In a monologue on the insignificance of his victims, he reveals the full extent of his amorality. He again offers a job to Martins and leaves. Calloway asks Martins to help lure Lime out to capture him, and Martins agrees, asking for Anna's safe conduct out of Vienna in exchange. However, Anna refuses to leave and remains loyal to Lime. Exasperated, Martins decides to leave but changes his mind after Calloway shows Martins the children who are victims of Lime's diluted penicillin, brain-damaged as a result of meningitis. Before writing the screenplay, Graham Greene worked out the atmosphere, characterisation and mood of the story by writing a novella. He wrote it as a source text for the screenplay and never intended it to be read by the general public, although it was later published under the same name as the film. In 1948 he met Elizabeth Montagu in Vienna. She gave him tours of the city, its sewers and some of its less reputable night-clubs. She also introduced Greene to Peter Smolka, the eastern European correspondent for The Times. Smolka gave Greene the stories about the black market in Vienna. Six weeks of principal photography was shot on location in Vienna, ending on 11 December 1948. Production then moved to the Worton Hall Studios in Isleworth and Shepperton Studios near London and was completed in March 1949. You know what the fellow said – in Italy, for thirty years under the Borgias, they had warfare, terror, murder and bloodshed, but they produced Michelangelo, Leonardo da Vinci and the Renaissance. In Switzerland, they had brotherly love, they had five hundred years of democracy and peace – and what did that produce? The cuckoo clock. Welles added this remark – in the published script, it is in a footnote. Greene wrote in a letter "What happened was that during the shooting of The Third Man it was found necessary for the timing to insert another sentence." Welles apparently said the lines came from "an old Hungarian play"—in any event the idea is not original to Welles, acknowledged by the phrase "what the fellow said". The likeliest source is the painter Whistler. In a lecture on art from 1885 (published in Mr Whistler's 'Ten O'Clock' ), he said, "The Swiss in their mountains ... What more worthy people! ... yet, the perverse and scornful [goddess, Art] will have none of it, and the sons of patriots are left with the clock that turns the mill, and the sudden cuckoo, with difficulty restrained in its box! For this was Tell a hero! For this did Gessler die!" In a 1916 reminiscence, American painter Theodore Wores said that he "tried to get an acknowledgment from Whistler that San Francisco would some day become a great art center on account of our climatic, scenic and other advantages. 'But environment does not lead to a production of art,' Whistler retorted. 'Consider Switzerland. There the people have everything in the form of natural advantages – mountains, valleys and blue sky. And what have they produced? The cuckoo clock!" This is Orson Welles (1993) quotes Welles: "When the picture came out, the Swiss very nicely pointed out to me that they've never made any cuckoo clocks", as the clocks are native to the German Black Forest. Writer John McPhee pointed out that when the Borgias flourished in Italy, Switzerland had "the most powerful and feared military force in Europe" and was not the peacefully neutral country it would later become. As the original British release begins, the voice of director Carol Reed (uncredited) describes post-war Vienna from a racketeer's point of view. The version shown in American cinemas cut eleven minutes of footage and replaced Reed's voice-over with narration by Joseph Cotten as Holly Martins. David O. Selznick instituted the replacement because he did not think American audiences would relate to the seedy tone of the original. Today, Reed's original version appears on American DVDs, in showings on Turner Classic Movies, and in US cinema releases, with the eleven minutes of footage restored. Both the Criterion Collection and Studio Canal DVD releases include a comparison of the two opening monologues. Upon its release in Britain and America, the film received overwhelmingly positive reviews. Time magazine said that the film was "crammed with cinematic plums that would do the early Hitchcock proud—ingenious twists and turns of plot, subtle detail, full-bodied bit characters, atmospheric backgrounds that become an intrinsic part of the story, a deft commingling of the sinister with the ludicrous, the casual with the bizarre." Bosley Crowther, after a prefatory qualification that the film was "designed [only] to excite and entertain", wrote that Reed "brilliantly packaged the whole bag of his cinematic tricks, his whole range of inventive genius for making the camera expound. His eminent gifts for compressing a wealth of suggestion in single shots, for building up agonized tension and popping surprises are fully exercised. His devilishly mischievous humor also runs lightly through the film, touching the darker depressions with little glints of the gay or macabre." One very rare exception was the British communist paper Daily Worker (later the Morning Star), which complained that "no effort is spared to make the Soviet authorities as sinister and unsympathetic as possible." Critics today have hailed the film as a masterpiece. Roger Ebert added the film to his "Great Movies" list and wrote, "Of all the movies that I have seen, this one most completely embodies the romance of going to the movies." In a special episode of Siskel & Ebert in 1994 discussing film villains, Ebert named Lime as his favourite film villain. Gene Siskel remarked that it was an "exemplary piece of moviemaking, highlighting the ruins of World War II and juxtaposing it with the characters' own damaged histories". James Berardinelli has also praised the film, calling the film a "must-see" for lovers of film noir. 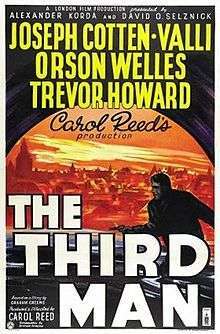 "The Third Man Theme" was released as a single in 1949/50 (Decca in the UK, London Records in the US). It became a best-seller; by November 1949, 300,000 records had been sold in Britain, with the teen-aged Princess Margaret a reported fan. Following its release in the US in 1950 (see 1950 in music), "The Third Man Theme" spent eleven weeks at number one on Billboard's US Best Sellers in Stores chart, from 29 April to 8 July. The exposure made Anton Karas an international star, and the trailer for the film stated that "the famous musical score by Anton Karas" would have the audience "in a dither with his zither". The Third Man won the 1949 Grand Prix at the Cannes Film Festival, the British Academy Award for Best Film, and an Academy Award for Best Black and White Cinematography in 1950. It was also nominated for the Academy Award for Best Film Editing and the Academy Award for Best Director. In 1999, the British Film Institute selected The Third Man as the best British film of the 20th century. Five years later, the magazine Total Film ranked it fourth. In 2005, viewers of BBC Television's Newsnight Review voted the film their fourth favourite of all time, the only film in the top five made before 1970. In the United Kingdom, films of this vintage are copyright protected as dramatic works until seventy years after the end of the year in which that last "principal author" died. The principal authors are generally the writer/s, director/s or composer/s of original work, and since in the case of The Third Man Graham Greene died in 1991, the film is protected until the end of 2061. This film lapsed into public domain in the United States when the copyright was not renewed after David Selznick's death. In 1996, the Uruguay Round Agreements Act restored the film's US copyright protection to StudioCanal Image UK Ltd. The Criterion Collection released a digitally restored DVD of the original British print of the film. In 2008, Criterion released a Blu-ray edition, now out of print, and in September 2010, Lions Gate reissued the film on Blu-ray. A British radio drama series, The Adventures of Harry Lime (broadcast in the US as The Lives of Harry Lime), created as a "prequel" to the film, centres on Lime's adventures prior to his "death in Vienna", and Welles reprises his role as Lime. Fifty-two episodes aired in 1951 and 1952, several of which Welles wrote, including "Ticket to Tangiers", which is included on the Criterion Collection and Studio Canal releases of The Third Man. Recordings of the 1952 episodes "Man of Mystery", "Murder on the Riviera", and "Blackmail is a Nasty Word" are also included on the Criterion Collection DVD The Complete Mr. Arkadin. A television spin-off starring Michael Rennie as Harry Lime ran for five seasons from 1959 to 1965. Seventy-seven episodes were filmed; directors included Paul Henreid (10 episodes) and Arthur Hiller (six episodes). Jonathan Harris played sidekick Bradford Webster for 72 episodes, and Roger Moore guest-starred in the installment "The Angry Young Man", which Hiller directed. ↑ "THE THIRD MAN (A)". British Board of Film Classification. 20 August 1949. Retrieved 19 February 2016. ↑ "The Third Man (1949)". BFI. ↑ "Nelly Arno". BFI. Retrieved 22 July 2015. ↑ "Harry in the shadow". The Guardian. 10 July 1999. Retrieved 23 December 2015. ↑ "'The Third Man' as a Story and a Film". Nytimes.com. 19 March 1950. Retrieved 2 September 2013. 1 2 Rosenbaum, Jonathan. Welles in the Limelight JonathanRosenbaum.net n.p. 30 July 1999. Web. 18 October 2010. ↑ Charles Drazin (21 May 2007). "Behind The Third Man". Carol Reed's The Third Man. Criterion Collection. Retrieved 15 August 2009. 1 2 "Shadowing the Third Man". documentary. BBC Four. December 2007. ↑ Noble, Peter. The Fabulous Orson Welles. Hutchison, 1956. 1 2 3 4 Aspden, Peter (13 June 2015). "Sewers, zithers and cuckoo clocks". Financial Times. pp. Arts 16. ↑ Feehan, Deirdre. "Senses of Cinema – Carol Reed". Sensesofcinema.com. Retrieved 2 September 2013. ↑ San Francisco Town Talk, February 26, 1916, reported in California Art Research: Charles J. Dickman, Xavier Martinez, Charles R. Peters, Theodore Wores, 1936. ↑ Nigel Rees, Brewer's Famous Quotations, Sterling, 2006, pp. 485–86. ↑ McPhee, John. La Place de la Concorde Suisse. New York, Noonday Press (Farrar, Straus and Giroux), 1984. McPhee is quoting "The Swiss at War" by Douglas Miller. 1 2 3 "Zither Dither". Time. 1949-11-28. Archived from the original on 2008-07-24. Retrieved 12 February 2015. ↑ "TOPS AT HOME.". The Courier-Mail. Brisbane: National Library of Australia. 31 December 1949. p. 4. Retrieved 24 April 2012. 1 2 Cook, William (8 December 2006). "The Third Man's view of Vienna". The Guardian. Retrieved 15 August 2009. ↑ "Kunst und Kultur. (…) Filme der Woche. Der dritte Mann". Arbeiter-Zeitung. Vienna. 12 March 1950. p. 7. Retrieved 6 June 2012. ↑ "The Third Man was a huge box-office success both in Europe and America, a success that reflected great critical acclamation ... The legendary French critic André Bazin was echoing widespread views when, in October 1949, he wrote of The Third Man's director: "Carol Reed ... definitively proves himself to be the most brilliant of English directors and one of the foremost in the world." The positive critical reaction extended to all parts of the press, from popular daily newspapers to specialist film magazines, from niche consumer publications to the broadsheet establishment papers ... Dissenting voices were very rare, but there were some. White, Rob. "The Third Man – Critical Reception". Screenonline.org. ↑ "The New Pictures". Time. 1950-02-06. Archived from the original on 2010-05-23. Retrieved 12 February 2015. ↑ Crowther, Bosley (3 February 1950). "The Screen in Review: The Third Man, Carol Reed's Mystery-Thriller-Romance, Opens Run of Victoria". The New York Times. NYT Critics Pick. Retrieved 15 August 2009. ↑ Quoted in the British Film Institute's Screenonline White, Bob. "The Third Man – Critical Reception". Screenonline.org. ↑ Ebert, Roger (8 December 1996). "The Third Man (1949)". Chicago Sun-Times. ↑ "Song title 199 – Third Man Theme". Tsort.info. Retrieved 2 September 2013. 1 2 The Ultimate Trailer Show. HDNet, 22 September 2010. ↑ The Third Man Trailer. YouTube. 17 February 2010. ↑ "Festival de Cannes: The Third Man". festival-cannes.com. Retrieved 11 January 2009. ↑ "AFI's 10 Top 10". American Film Institute. 17 June 2008. Retrieved 18 June 2008. 1 2 Hirtle, Peter B (3 January 2014). "Copyright Term and the Public Domain in the United States". Cornell Copyright Information Center. Retrieved 26 August 2014. ↑ "The Third Man (1949) – The Criterion Collection". Criterion.com. Retrieved 6 March 2010. ↑ "Supreme Court Takes "39 Steps" Back From Public Domain". Aplegal.com. 19 June 2014. Retrieved 27 June 2014.